Devon-based GripHero Ltd, the developer of a revolutionary new hand-protection dispenser that enables drivers to avoid contact with contaminants on fuel pump handles, has started the distribution of the world’s first anti-static, fully recyclable hand-protection solution across the UK. The dispenser, which sits on top of each and every fuel nozzle on the forecourt, ensures that drivers can retrieve and wear hand-protection without coming into contact with dirty or contaminated fuel handles, which have been shown to be 11,000 times dirtier than the average loo seat. BP Whitehouse Services in Okehampton, which has over 1,500 fuel customers a day, became the very first forecourt in the country to install GripHero. 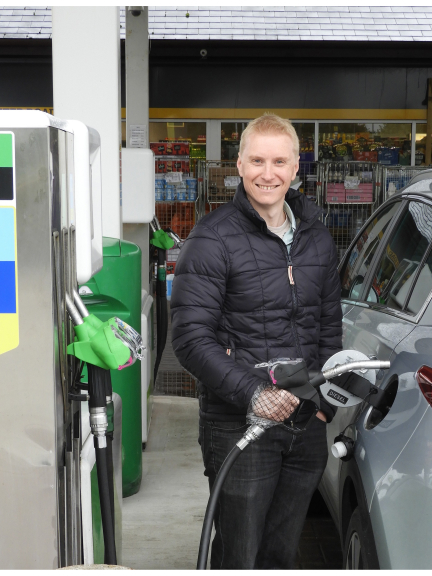 The dispensers were hand-delivered on Friday evening, and BP Whitehouse Services’ Forecourt Manager, Dean Beardon, got up at 6am on Saturday to install them, ensuring that their customers were the first in the country to benefit from GripHero. Over 250 forecourts will receive the dispensers over the coming month. In addition to independent forecourts, GripHero is being installed on franchised forecourts featuring major brands including Texaco, Esso, Murco, BP and Gulf. Further significant domestic contracts are also under discussion. By the end of the year over 500 forecourts will have GripHero in the UK and Ireland, with more to follow in 2019. A number of major and overseas contracts are also under negotiation, which could see GripHero introduced to forecourts in mainland Europe and the Middle East. By placing dispensers on each and every fuel nozzle handle, GripHero hopes to end the all-too-common customer experience where drivers struggle to find hand-protection, due to empty or poorly located dispensers. Its research shows that despite 75% of people actively looking to keep their hands clean, four out of five people have trouble finding hand-protection at garages and forecourts up and down the country. Oli Yeo, who designed GripHero, comments: “GripHero has been created to put the health and wellbeing of the customer at the heart of the forecourt, both in the prevention of biological and chemical contamination from the nozzle, and the prevention of potential ignition caused by static from standard gloves in the refuelling zone.